The House Criminal Jurisprudence Committee advanced a marijuana decriminalization bill on Monday with the help of two Republicans. With a 4–2 vote, the committee approved House Bill 81, authored by Chair Joe Moody, D-El Paso, at Monday’s hearing. Under HB 81, police would ticket someone caught with an ounce or less of marijuana rather than charging them with a Class B misdemeanor, which carries a punishment of up to six months in jail. The measure passed with bipartisan support, but both no votes came from Republican freshmen — Cole Hefner, of Mt. Pleasant, and Mike Lang, of Granbury. Republicans Todd Hunter, of Corpus Christi, and Terry Wilson, of Marble Falls, joined the committee’s Democrats in advancing the bill beyond its first legislative hurdle. Last session, Moody carried a nearly identical measure. Several Republicans, including David Simpson and Bryan Hughes — both of whom are no longer in the House — signed on to Moody’s bill as co-authors in 2013, but no GOP member supported the measure as a joint author, which is a greater show of support. Moody will need all the help he can get from Republicans, including House Criminal Jurisprudence Committee Vice Chair Hunter, who voted in support of the bill on Monday. The proposal now advances to the Calendars Committee, which determines the flow of legislation into the full House. Hunter chairs the powerful committee, which comprises 10 Republicans and five Democrats. Hunter will play a major role in determining whether HB 81 makes it to the House floor — further than any bill lessening penalties for marijuana offenses has made it in the legislative process. I feel like this bill will have a decent chance to pass the House – it should at least get a vote, unless it becomes clear the numbers aren’t there for it. The prospects seem longer in the Senate, but at least now-Senator Bryan Hughes ought to support it. Even if it doesn’t go the distance, each step farther improves the odds that something like it can get passed in a future session. Public support is ahead of the Lege on this issue, and it will likely take a few more cycles to catch up. For this legislative session, Representative Mike Lang has filed two bills to further a couple longstanding goals that have been planks in the Texas Republican Party’s party platform; namely (1) enforcing voter registration by party (see party plank 66), and (2) drastically cutting down on the frequency with which elections take place (party plank 76). Voter registration by party is a common feature of registration in a number of states that have so-called “closed” primary elections, such as New Mexico, New York, and Oregon. (In this context, a primary election is “closed” if the election is administered in such a way as to exclude participation by voters who are not registered as members of the same party). Current state law already specifies that by voting in a party primary, a person affiliates with that party for a full calendar year, and is prohibited from voting for or signing a nominating petition for any candidate not affiliated with that party. But under current Texas law, registered voters are not compelled to self-identify as being members of one party or another, and functionally are unaffiliated with any party unless and until they decide to vote in one or another party primary election. 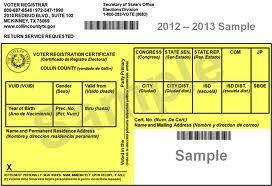 Additionally, under current law, Texas voters aren’t permanently assigned to be members of one party or another. H.B. 1072 proposes a change in the existing law by outlining a procedure for permanent voter registration by party affiliation in Texas. H.B. 1271 – A reduction in the number and frequency of local elections is (as noted above) a key legislative goal of the Republican Party. Prior to 2005 (and the enactment that year of H.B. 57, which eliminated the winter and summer election dates, and severely curtailed the capacity of local governments to order special elections for non-uniform election dates), elections in Texas were traditionally conducted on one of four days in a year. Winter elections took place in January (later moved to February), Spring elections happened in April (later moved to May), Summer elections were held in July (later moved to August), and Fall elections were held in November. Winter elections tended (for reasons relating to fiscal budget cycles) to be bond elections for cities and school districts. Spring elections were officer elections for local governments. Summer elections were used for run-offs, local incorporations, and some small government officer elections. And the November elections were (as they are now) the “big show” – federal and state officer elections in even-numbered years, and state constitutional amendment elections in odd-numbered years. In a bold stroke as part of an omnibus school finance bill enacted in the third called special legislative session in 2006, local elections in odd-numbered years were largely eliminated with a change in the Texas Education Code regarding school district board election schedules. Subsequent legislative efforts have been focused on “cleaning up” all those nooks and crannies of state law that still permit some flexibility on election scheduling, in order to further limit the number of elections taking place in any particular year. H.B. 1271 would get rid of all elections in odd-numbered years, and all May elections. The bill would limit all elections (including bond elections, water district elections, local government elections of all forms, etc. ), by requiring that these elections either take place on the same day as the political primaries or the statewide officer elections (i.e., the first Tuesday of March or the first Tuesday after the first Monday in November of even-numbered years). The main effect of HB1072 would be to lower turnout in primary elections. There’s certainly a case to be made that only Republican voters should choose Republican candidates and only Democratic voters should choose Democratic candidates (*), which is not how it is with open primaries. I don’t have any particularly strong feelings about this bill, but as it is with many other bills these days I don’t see that there’s a problem that needs to be addressed. I’ve never felt the need to vote in a Republican primary, but I do know some people who have done that for a variety of personal and strategic reasons. I don’t see any reason to believe enough people do that to make a difference, but whatever. As for HB1271, I recall during Tom Craddick’s time as Speaker that some people pushed for even-year-November-only elections on the grounds that it would make all elections more explicitly partisan, which (given that this was being pushed by conservative groups) would presumably redound to the benefit of the Republicans. I have a hard time understanding the logic of that now – in Houston, at least, the main effect would be for turnout in city elections to be much higher, with a more diverse electorate, which I think we can all agree would not be beneficial for Republican candidates. I’ll put it to you this way – under the pre-2011 Houston Council Council map, only Districts A, E, and G would be clearly Republican-leaning, with the city as a whole being easily over 60% Democratic. We would not have the Council we have today if our most recent city election had been this past November. Beyond the illusory “savings” outlined in the post, I’m honestly not sure what the goal of this bill would be, given who its supporters are. Be careful what you wish for, is what I’m saying. (*) Green and Libertarian candidates are chosen by convention rather than primary, so this doesn’t directly apply to them.